Have you ever wanted to buy a concert ticket only to find out that the current tickets are only on sale to those lucky individuals that happen to know the concert presale password? If you know where to look, these presale passwords aren’t that hard to find across the internet, but I found out that a lot of people I knew had no clue where to look, and this gave me an idea. 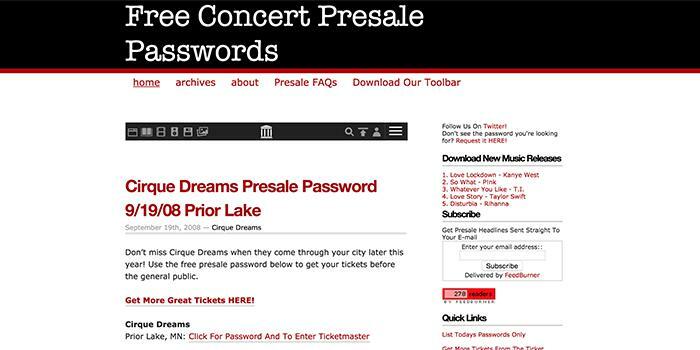 In December of 2007 I decided to aggregate all of the presale passwords I could find across the internet into one place. An easy to read/search blog that would list out all of the various concerts and events for the day, along with the presale password that would allow you to buy tickets ahead of the general public. There were a handful of sites out there doing exactly what I was doing already, but there were really only 2 or 3 that I found to be fairly consistent in their updating so I figured there was definitely room to move in on their space. It was pretty hard for me to come up with a good .com domain name for the site that incorporated the words “presale” and “tickets” into the domain, so I opted for a .info, presaletickets.info. Sure, it wasn’t ideal, but at the time I didn’t know if this venture was going to be successful and I didn’t really feel like spending money on a more prominent .com domain, especially since what I wanted wasn’t available, so I would have had to make an offer to someone who already owned the domains, and that wasn’t going to be cheap. So I opted for the .info domain and started setting up the site. The site itself was going to be super simple, nothing flashy just a single text blog post per event with an image, a quick sentence or two about the event (for SEO purposes), the presale password, a link to buy the tickets at ticketmaster, and then some eBay affiliate links for tickets to that same concert. You can actually still see an example of what I was doing here. 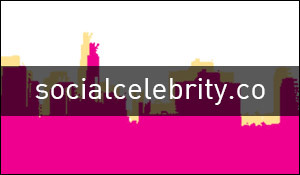 This style of post was bringing in a decent amount of traffic after a while, but it wasn’t bringing in a lot of money. The only source of revenue from doing the presale posts this way was a link to Ticketmaster that didn’t really stand out, and those eBay links, and since people were trying to buy the tickets themselves, not many people were trying to go to eBay to buy them on the second hand market. Something had to change in the way I was doing the posts if I was going to make any real money. In February of 2008, I decided to figure out a better way to funnel people to Ticketmaster in order to make the commission off of the ticket sales, so what did I do… I stole the same method the sites I was aggregating from where doing. I set it up so that in order to obtain the password for a certain event you had to click a link, that link would then launch a popup dialogue box that gave you the presale password to that event, and when you clicked “OK” it would then send you over to Ticketmaster. And in doing so, you were basically clicking on my affiliate link, so any tickets you then purchased while on Ticketmaster would net me a commission of the sale. If you click here and look at the Tampa Bay Rays post you can see an example of this. With this method in place I turned to promotion and advertising. When a big name concert would go on presale I would buy up a few ads on Google Adwords and throw a little money at them, but since there wasn’t much competition in the ad space, I wasn’t spending more than like $5-7 a day on ads. And my sales each day usually netted me way more than that, especially when things like Hannah Montana and Kanye West tickets would go on sale. The only downside to the whole thing was that most popular concerts would go on sale either in the late fall/winter or early spring, for the summer shows, so I only had a small window to make a bunch of sales. 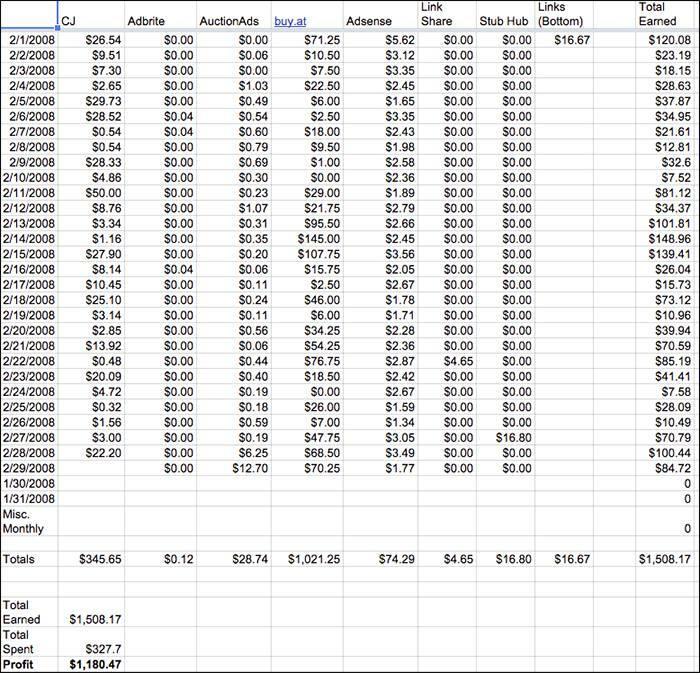 I still have a few of the spreadsheets I used to track my revenue during this period, so here’s a screenshot of February of 2008. This was just 3 months after launching the site and I was pulling in a profit of $1180 a month for about 30 minutes of work each morning. That’s incredible! buy.at is the affiliate network that Ticketmaster was working under (it no longer exists). In November of 2008 I moved the site over to a .com domain, mypresale.com and continued to make a decent amount of money during the concert ticket sale season. I also changed up the formatting of the posts slightly so that things were easier to read, and also added StubHub links directly to the various concerts in case people wanted to buy their tickets on the second hand market. You can see what the mypresale.com site looked like here. In May of 2010 Ticketmaster decided to stop allowing their affiliate program to be used on websites dealing in presale passwords, and since Ticketmaster was my main source of income for the site, it was no longer worth my time to keep the site updated with passwords. 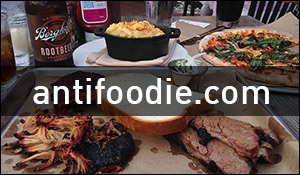 May 13, 2010 was the last day I updated the site. It was a sad day. Looking back on it, I probably should have continued to build up the site, post presale passwords and tried to find other revenue streams; Stubhub and eBay were bringing in a few sales here and there, but nothing like Ticketmaster was. But what can you do. Instead, a few months later, I sold both domains to the website that I was actually getting most of my presale passwords from in the first place for about $500. I figured that was a solid price considering the main revenue source was no completely dried up. It looks like the guy is still running the site, but it no longer provides presale passwords it just kind of pushes you towards other concert ticket websites in order for him to try and make some money, and I hope he’s doing well. This was by far my most lucrative internet venture in terms of affiliate network marketing and I really wish it hadn’t crashed like it did, but that’s how these affiliate projects go. You can’t put all your eggs in one basket because eventually either someone is going to do what you’re doing better, Google is going to crush your results page rankings and you’ll lose all your traffic, or you’ll get dropped from your affiliate program. One of those things is bound to happen, so make sure you spread yourself out.